The Santa Rita mountain trails usually go only in two directions, straight up or straight down. The Chinaman trail is a relatively easy flat trail that takes you into a remote canyon with outstanding views across the Sonoita valley. Largely unaffected by forest fires it is a little used well marked trail that is much nicer than the nearby Gardner canyon trail that goes straight up to the Super Trail through rubble and a burned area. The bottom line is if you want a leisure day hike in the Santa Ritas this is your trail. Getting to the trailhead is easiest with a 4 wheel drive, but can be done in a high clearance car especially if it is a rental car. There are several creek crossings but for the most part the road is well graded. If you don't have the 4x4, you can park at the Arizona trailhead just past the ranch houses on the way into Gardner canyon and take the Arizona trail south. This adds about 3 miles of easy hiking to the trip and is less scenic than the Casa Blanca Canyon. The Chinaman trail follows an old water ditch that was built in 1902 to supply water to mine gold at Kentucky Camp some 8 miles away. The ditch and waterway were constructed by Chinese labor, hence the politically incorrect name. The trail actually starts at Tunnel Springs, which gets its name from where the laborers cut a tunnel through the hill to keep the water flowing downhill from Casa Blanca canyon to Gardner Canyon.. The Chinaman trail head is at round metal stock tank with a sign that says tunnel springs and the Arizona trail (signs are politically correct) Do not continue on the road up the hill to Gardner Canyon Trailhead, take the trail up over the hill to the south into Casa Blanca Canyon to pickup the ditch/trail on the other side. You will encounter another larger stock tank and the ditch/ trail will hug the canyon wall. After about a mile there will be a small tunnel though some boulders and after about 2.6 miles the ditch will end at bear spring. Bear spring is a good place to turn around because from here the trail goes straight up hill for about 1.5 miles to intersect the Walker Canyon trail. You can make this a loop hike by taking the Walker Canyon trail 1.5 miles over to the Gardner Canyon trail then down the 4x4 road back to Tunnel Springs. The Walker Canyon trail is closed due to fire damage and erosion, but passable at your own peril. I would not recommend it because the trail and views are pretty bleak due to the fire and there is a lot of road hiking. From I-10 Tucson, travel east on I-10 approximately 20 miles to the highway 83 exit. Exit to 83 south and go 21.5 miles to the sign for Gardner Canyon road to the west. 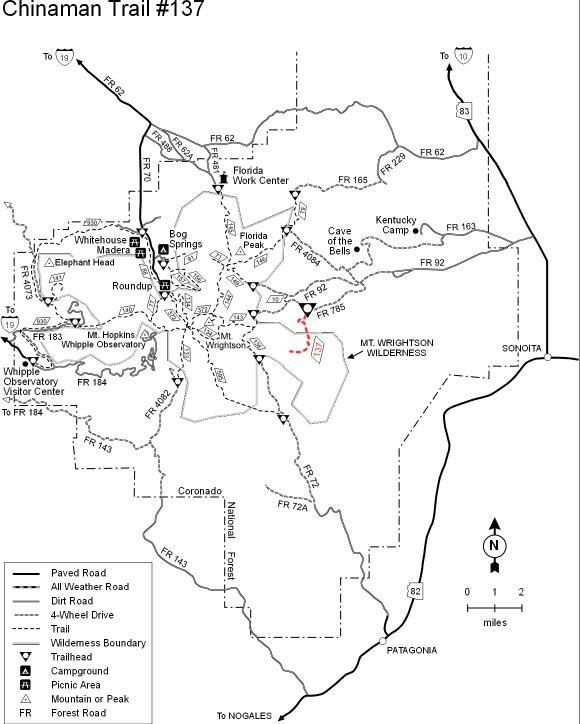 Turn west on Gardner canyon road (forest service road 92) for 6.3 miles . Turn left on forest service road 785(Gardner canyon road) about 3 miles to tunnel springs. There is a small round water trough next to a barb wire fence and AZ trail sign. Plenty of parking at trailhead.